I hate deflation ... when I'm selling. The CSO says prices in my business sector (market research) are falling and back to where they were before 2006. Sounds about right. But I love deflation ... when I'm buying. It seems the costs of lot of things I buy - be it inputs into my business or simply as a consumer - are still falling: the consumer price index is back to 2006 as well. And I'm not alone in my infatuation with deflation. I asked a question on my company's omnibus survey of 1,000 adults in the Republic of Ireland last week about the trend in 'purchasing power'. Given the downward trend in incomes after tax thanks to tax rises, salary and wage cuts, and not to mention job losses, you might expect that people would be feeling over-stretched. 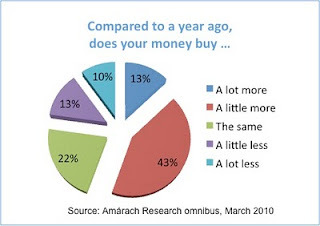 But here's where deflation comes in: when asked 'does your money buy a more or less than it did a year ago' the majority, 56%, clearly say that it buys more (13% say it buys a lot more, as seen in the chart). Deflation seems to have compensated for some of the income reduction experienced by most people in the past few years (though admittedly not all of the extra 'stretch' in purchasing power is down to deflation: if you simply stop spending then you've got 'more' to spend ...). Curiously, men are more likely than women to say their money is going further (59% vs 53%), along with middle aged groups (62% of 45-54s) and those in higher social classes (59% of ABC1s). Nevertheless, majorities in every sub-group of the general population say that their money is going a lot or a little further than a year ago. 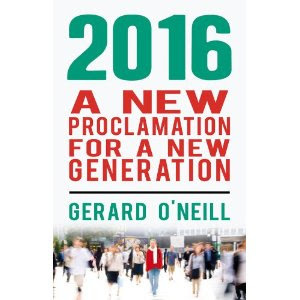 All of this is just as well, of course, because deflation has a firm grip on Ireland. We are experiencing what Richard Koo correctly calls a Balance Sheet Recession, with all that that entails in terms of falling asset prices and the generalised deflation that results from it. As he says himself in a fascinating interview in Weedon & Co's newsletter, it takes years for businesses and households to 'clean out' their balance sheets after an asset bubble bursts, all part of a long term process of bringing debts back into a sustainable ratio with revenues and incomes. Deflation is a saver's friend and a borrower's enemy. The former gains from seeing the purchasing power of their savings increase over time (even with near-zero interest rates), the latter suffers from seeing the value of their securities, against which they borrowed, decrease over time. Likewise deflation is good for the consumer but is tough on the retailer if his or her revenues are falling (due to falling prices) whilst rent and borrowing costs are high or rising. What about growth? A price-cut for a price-cut soon leaves everyone broke. Koo's solution is a massive government spending binge, fuelled by borrowing all the money going into savings (since no businesses are borrowing as they're all too busy repaying debts). The problem here in Ireland is that - sure enough - we're getting the massive borrowings, but instead of new railways, schools and hospitals we're getting ... NAMA. I suspect we'll have - yet again - a two-speed economy in Ireland for the foreseeable future. The foreign owned companies that were built on things other than flipping property (pharma, IT etc) will do well from the global economic recovery now under-way, and some of that will reflect back on Ireland. But many of our indigenous companies - who discovered that flipping property was, for a while anyway, far easier than making and selling stuff that other people might actually buy - will take much longer to recover. This "fear of deflation" is largely nonsensical. Deflation does not keep people from spending – they always spend what's necessary. And money NOT "spent" is then saved which means it is credit to someone who invests it for capital goods etc. thus it is again being spent, only not for consumption. Money never lies completely idle to any extent whether there's inflation, deflation, stability or a solar eclipse. For deflation to seriously happen, not only the current extreme credit expansion by the central banks and states (through "quantitative easing", stimulus packages, monetising and then spending national debt etc.) but also the money that was released into the economy PRIOR to the collapse would have to be "mopped up" again. This is nowhere to be seen nor would it be technically possible (confiscation aside) so we will rather see inflation than deflation.